Save lives, preserve property and the environment, and ensure the health and safety of ourselves and the community. Due to population growth, of the Town of Fairfax was in need of its own fire station and in April 1928, the Fairfax Volunteer Fire Department was formed. This was the third fire station in Fairfax County and was given the station designation of 3. In 1940, the first paid firefighters started working alongside the volunteers. 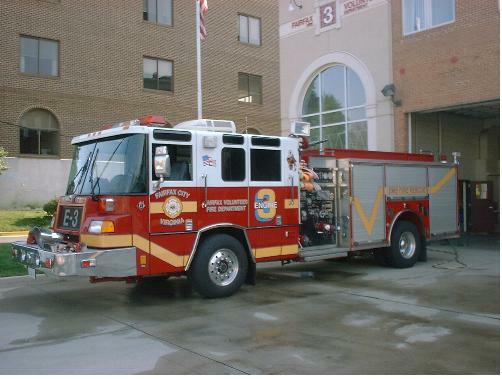 On May 1, 1978, the City of Fairfax Fire Department was formed with the second fire station (Fire Station 33) and opened in January 1979. Today the two departments form one combination fire department and work side by side to accomplish our mission through our core values. Professionalism - Performance of duties in the community with a focus on safety, teamwork, competency, loyalty, and leadership in the region. Respect - Working with residents, visitors, and employees in a fair and compassionate manner and helping those in a time of need. Integrity - Maintain community partnerships built upon honestly, trust, fiscal responsibility and accountability at all levels. Diversity - Respect and support of all cultures and backgrounds within the organization and the community we serve. Excellence - Strive to innovate and achieve the highest standards of care while maintaining excellence in education, technical training, and service delivery. Every Friday Night at 7:00 P.M. Host an event with us. Check availability of rental hall. Help provide aid to FVFD in times of need. Stay updated on what is happening with FVFD. Have questions, we've got answers.